In constructing the inner loop, I counted down from 20 (instead of up from 1) because I figure fewer numbers are divisible by 20 and 19 than by 1 and 2. This way the first false condition is found sooner than later, and no time is wasted. Further, every integer from 1 to 10 divides evenly into some integer from 11 to 20. Therefore it’s not necessary to check 1-10; 11-20 is enough. I constructed my loop using a boolean flag, isDivisble, that is reset every time we increase the outer loop by 20. The flag allows me to break out of the inner loop as soon as I find a number that is not divisible, so no time is wasted. 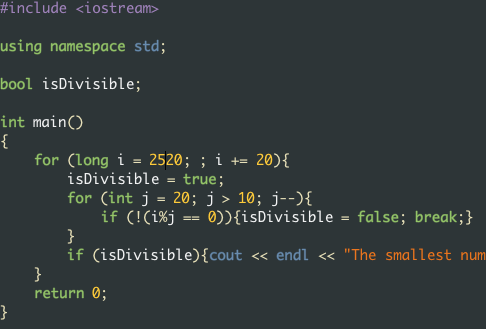 Although my compiler allows me to use an int and still come up with the correct answer, the C++ standard only requires an int to hold 16 bits, or ~65,000 unique values (positive and negative). Since the answer is greater than 65,000/2, an int on some compilers may not produce the correct answer. A long is guaranteed to hold at least 32 bits, or over 4 billion unique values, so I used a long in my solution just as a best practice. With only that change, it takes twice as long to run. Efficiency is priority #1, people! print "The smallest number that is evenly divisible by all integers between 1 and 20 is " + str(i) + "."